The band will hit the road for a short U.S. tour beginning March 3. For Scars and System fans who have been anxiously awaiting new music, 'Dictator' will give them the fix they’ve been craving. It wasn't too long ago, but hey, it's fun to reminisce. Here is this week's gallery of Guitar World issues past. It's a Cinderella story. A come-from-behind winner takes top honors in this week's Best Album poll. Visionary songwriter. Mad lyricist. Genius guitarist. Obsessive shut-in. There are so many sides to System of a Down's prolific guitarist Daron Malakian that it took two albums to contain them. 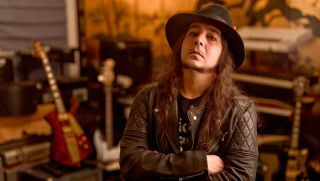 With System of a Down on life support, Daron Malakian takes his act to the next stage with Scars on Broadway, his new rock-inspired band. Collaboration between System of a Down guitarist-frontman Daron Malakian and drummer John Dolmayan will see its self-titled debut released on July 29. System of a Down’s Serj Tankian and Daron Malakian go their separate ways with new projects.